Torture-tested by the elements and harvested by hand in Finland, the raw materials of the Arctic are the most potent on Earth. Lumene harnesses the power of these berries and plants into effective skincare and cosmetics developed to illuminate your unique, natural beauty. The efficacy of Lumene products is based not only on pure, wild Arctic materials but also on the latest technological innovations in the field. Their overall aim is to use at least 80% natural ingredients in all Lumene skincare products. Recently, the celebrities of the Sundance Film Festival 2012 were invited to pamper their skin with "The Power of Arctic Nature" and were treated to a Lumene Arctic Nature Kit. Lumene was generous enough to allow me to sample the same kit featured at the Festival. Keep reading to learn more! Radiant Touch Moisturizing Toner - Radiantly refreshed and perfectly clean skin! This refreshing toner is formulated to perfect your skin cleansing. Detoxifying, unique arctic cloudberry nectar helps to boost your skin's natural brightness. This toner with invigorating scent leaves skin perfectly clean, bright and radiant. Radiant Touch Cream Cleanser - Radiantly refreshed and perfectly clean skin! This light, creamy foam cleanser removes all make-up and impurities as it refreshes with its invigorating scent. Unique arctic cloudberry oil helps to boost your skin's natural radiance. Leaves skin feeling clean, fresh and radiant. Radiant Beauty Drops - Defy aging and discover more radiant skin by capturing the power of encapsulated Vitamin C and Arctic Cloudberries. Pure Radiance Day Cream SPF 15 - Helps to prevent and delay damage under your skin surface while smoothing the appearance of wrinkles that have already formed. Wipes will take off all your makeup in one easy step - with no mess and no irritation. These alcohol-free wipes sweep quickly, gently yet thoroughly away dirt, oil and makeup from the skin without water. Soft wipes are super-convenient and really easy to use, also travel-friendly. The cream helps to maintain the skin’s youthfulness, has a firming effect and prevents the formation of lines. 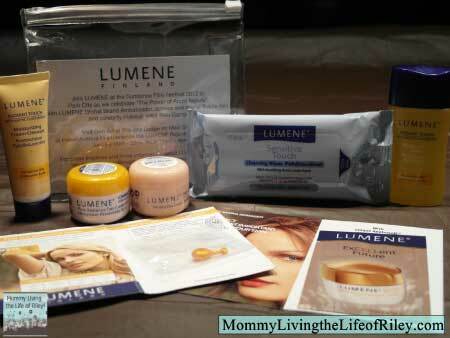 Disclosure: I received Arctic Nature Kit from Lumene in order to facilitate my review. No other compensation was received. This product review is based on my own personal experiences with this item and is completely honest and objective. Just wondering if that newly introduced to the US via UK skin care line has anything good for oily skin that is aging and still fighting off formation of blackheads. Or, maybe you would know what would be good for my complexion. Thank you for your input. I never know what to put on the line above that comes after name, email address. It asks for web site. I followed the links to get to this web site but started out with HEB.com. Great questions regarding products best for oily skin…to my knowledge, the Lumene product line is best for normal to oily skin and the items I received didn’t make my skin feel greasy or anything. My skin tends to lean towards the oily side too and because of this, I will NOT wear anything which adds to the shine during the day. I also liked the Orchid line of products I tried from H-E-B. I was amazed at how light these were on my skin and how quickly they were absorbed. I think you’ll like the Orchid line and they were also very affordable too.